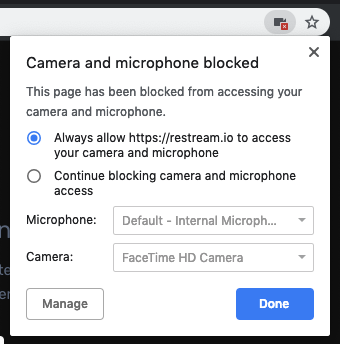 If you have issues using Restream GoLive or get a Permission Denied error, we may not have permission to use your webcam in your web browser. Below are the steps for supported browsers on how to grant permission. 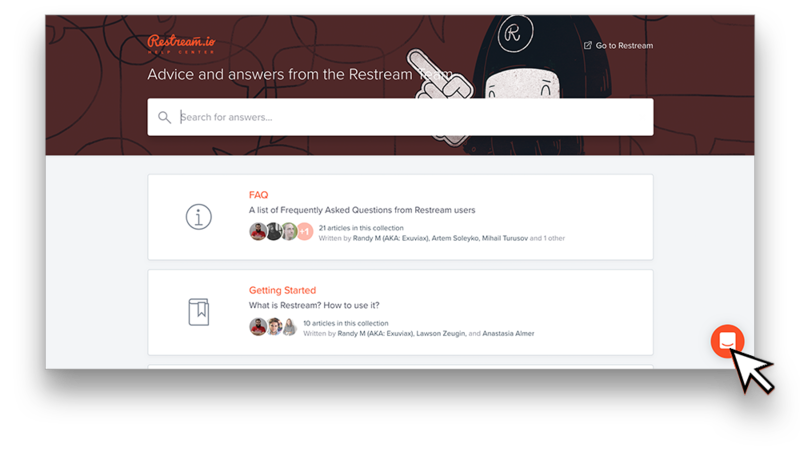 At this time, Restream GoLive only officially supports the latest version of Firefox or Google Chrome. Some browser extensions can prevent Restream GoLive from functioning correctly. We also recommend that you be connected over Ethernet and not WiFi for the best results. Mobile is not supported at this time. If you’re not seeing this prompt, there should be a camera icon in the URL Bar of Google Chrome. Click that icon and make sure you are allowing Restream access to your webcam and microphone. After you’ve allowed the permissions, click ‘Done’ in the prompt and then ‘Retry’ in the GoLive window or refresh the page. 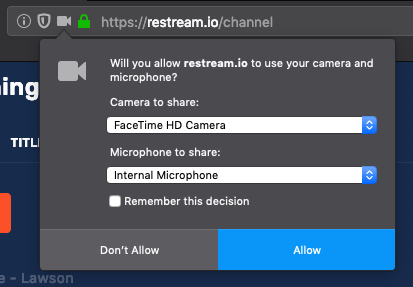 When you first load GoLive, Firefox will ask if you want to grant Camera and Microphone access to Restream. Click “Allow” and GoLive will begin to work. If this prompt is not showing, try refreshing the page and checking again. If the prompt is still not there, click the camera icon in the URL Bar and click the settings icon next to “Permissions” and edit your preferences for granting access.